The days of being deprived of ooey-gooey s'mores, caramelized yams, and sweet, delicious Rice Krispie Treats are over thanks to vegan marshmallows. A handful of companies now offer the soft pillows of fluff to individuals who live gelatin-free lifestyles. 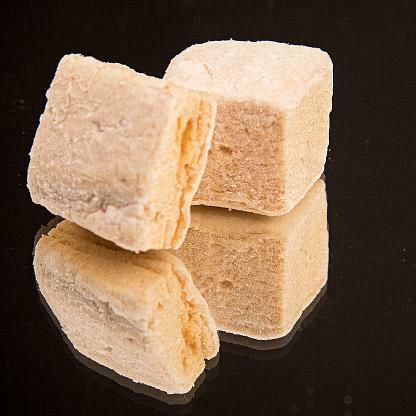 Unlike traditional marshmallows, vegan marshmallows do not contain gelatin. The translucent binding agent in a standard marshmallow is derived from animal bones, cartilage, organs, tendons, and skins, which is why vegans avoid it. Instead of gelatin, vegan marshmallows feature a number of alternative ingredients, including soy protein hydrolysate, carrageenan, locust bean gum, and agar powder. These ingredients are combined with organic sweeteners to create mouthwatering marshmallows that can be transformed into decadent desserts. For years, people who swore off animal products embraced Vegan Supreme Marshmallows. But in 2005, the company was exposed for using Emes Kosher-Jel in their marshmallows. The Kosher-Jel was marketed as a vegetarian alternative to standard gelatin; however, when the product was analyzed in a laboratory, it was found to contain animal protein. Shortly after scientists revealed their findings Vegan Supreme Marshmallows were discontinued. It took an entire year for another company to develop a new recipe for vegan marshmallows, and now the tantalizing treats are back on store shelves and selling like hotcakes. New York-based bakery Sweet and Sara persevered following the Emes Kosher-Jel scandal, and the company is now considered the leader in vegan marshmallow production. In 2006 VegNews named their mountain high marshmallow Product of the Year. The monster-sized, soft and squishy, square-shaped treats are available at Whole Food stores and online. Other companies make good vegan marshmallows, as well. Angel Food. This company offers a kit that allows you to make your own vegan marshmallows by adding different flavors to sugar, water, syrup, vanilla, and cornstarch. One kit yields 50 specialty marshmallows. Suzanne's Specialties. The vegan-friendly company features Ricemellow Creme, a gelatin-free version of the original Marshmallow Fluff. Suzanne's Specialties uses brown rice syrup as a sweetener in its fluff, which is void of all animal products. Vegan marshmallows are extremely popular and rather expensive. If you can't get enough of the sinfully sweet treats but don't have a lot of extra money to spare, then consider making vegan marshmallows at home. This recipe works in two steps: First, make the stiff fluff. Then, you'll create sugar syrup that will add both flavor and texture. Combine the dry ingredients in a stand mixer. Pour in the water and whisk for 10 minutes, until it thickens and peaks. Mix the Genutine and sugar in a sauce pan with the heat off. Add the water and whisk quickly until the mixture is thick and thoroughly combined. Add the corn syrup and bring the stove up to medium-high heat. Stirring occasionally, bring the mixture up to 230 degrees Fahrenheit. The mixture will bind together as one mass. Place a splatter shield on the mixer. Whisk the fluff on high and quickly add the syrup. Pour the mixture into a baking pan, lightly oiled and dusted with a 1:1 mixture of sugar and cornstarch to prevent sticking. Place the pan in the refrigerator and chill for at least an hour. Try these other tasty vegetarian marshmallow recipes, as well. There are a number of online marshmallow recipes that market themselves as vegan-friendly, but call for gelatin or Emes Kosher-Jel. Avoid these recipes if you live an animal product-free lifestyle.